No pun intended but the "ultimate" Avengers movie has arrived on DVD that is based on the comic by Marvel Comics which features one of the greatest superhero teams of all time, "The Avengers". So what exactly is the Ultimate Avengers about? The tale revolves six of the greatest superheroes of all time, Captain America, Iron Man, Black Widow, Thor, Giant Man and the Wasp and when Earth is danger of being invaded by metamorphosing aliens, they work together in defeating this otherworldly menace. 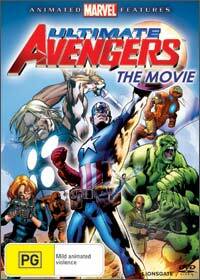 Joined by the Hulk in an extremely entertaining fight scene, with flash backs to World War II, the Ultimate Avengers Movie also features a wide variety of other Marvel comic book characters in this thrilling and entertaining animated DVD. The animation of the Ultimate Avengers Movie is quite impressive, although not as "fine" as some of the other Warner Bros cartoons, the colours are exceptionally vivid and some of the choreography is thoroughly impressive. Match the 16:9 widescreen presentation with true Dolby Digital 5.1 and this is almost a cinematic experience with great voice acting and a great Hollywood sounding musical score.